Real Time Gaming, also known as RTG, is a company that was founded back in 1998 in Atlanta, Georgia. Real Time Gaming is a well known name in the online gambling business since it develops high quality casino games which are very popular among players. In 2007, the company has moved to Costa Rica and it was acquired by Hastings International. Unlike many other casino software providers, Real Time Gaming accepts players from the USA because most of the casinos that use this software are located in America. Real Time Gaming during the years has developed over 100 casino games and it is best known for its Real Series Slots. 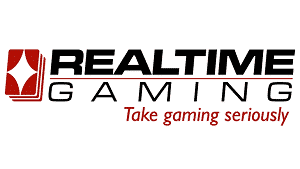 Real Time Gaming to its customers offers slots, table games, scratch cards and video poker games. Therefore, casinos powered by this provider can meet any player’s needs and expectations. Even though Real Time Gaming still hasn’t stepped into the Bitcoin gambling industry, it is expected that Bitcoin casinos will start featuring its games very soon. Real Time Gaming offers downloadable software and flash games. As usually, the game selection to those who will download the software is better as well as the graphics is sharper. However, those who like to play instantly via their browsers can do so by simply selecting the game in the casinos’ game menu. Real Time Gaming offers a good number of flash titles that belong to different game categories. Furthermore, this casino software is available to both Windows and Mac users. Real Time Gaming, as a leading software provider, develops high quality slots, table games and video pokers. Also, the company supplies some instant win and skill games; however, it is the most popular for the three previously mentioned types of games. Real Time Gaming has a good number of top notch quality slots which have unique and special features as well as offer progressive jackpots. The most popular titles of this category are the ones that belong to the Real Series Slots collection such as Achilles, Caesar’s Empire and Cleopatra’s Gold. Some other games worth mentioning are High Fashion, The Prince of Sherwood and Megasaur. Players at Real Time Gaming powered casinos can enjoy the most popular table games such as baccarat, roulette, blackjack and poker. Some of the variants of these games features at RTG casinos are European Blackjack, Tri Card Poker, French Roulette and Pontoon. More than 15 video poker variants can be played at Real Time Gaming powered sites. The provider included in its offer the most commonly played variants such as Jacks or Better, All American, Double Bonus and Deuces Wild. Finally, what makes Real Time Gaming software that attractive is the fact that it is completely safe and fair. The random number generator of the software is regularly tested by independent auditors like Technical System Testing (TST); therefore, users can always play without worrying whether their information is safe or whether the outcomes are fixed.